Know about the NWS Storm Prediction Center? Since we’ve started this blog out with a few severe weather posts, I wanted to share something. Did you know that the National Weather Service has an office with the sole responsibility of predicting the country’s severe weather threats? Based in Norman, OK, the Storm Prediction Center (SPC) keeps an eye out for the conditions that create high winds, hail, and tornadoes. This is no knock against The Weather Channel or Dr. Greg Forbes and his TORCON index, but I always consult the SPC first when I’m looking out for some severe weather. The first thing you should check out is the convective outlooks. It will show areas the could see thunderstorms or severe weather on that day, as well as the next week. Areas shaded in green have the potential for thunderstorms. Yellow, red, and magenta indicate a chance for severe weather. It should be noted that not every thunderstorm is considered severe. You need winds of 58 mph (50 knots) or 1″ diameter hail. You can also look at the chances for any of the three main hazards, like this one for high winds. 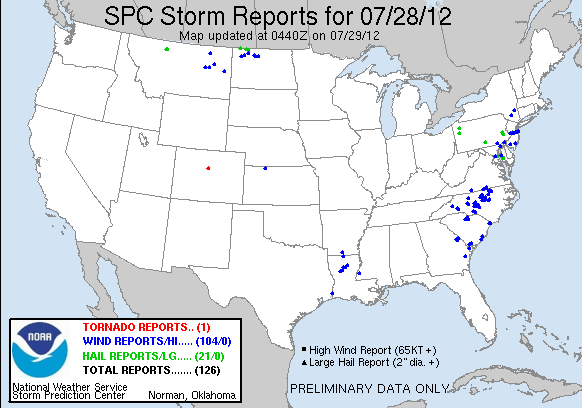 Another great use for the SPC site is their database of storm reports. After any storm outbreak you can quickly find out where damaging winds, hail, and tornadoes were reported. Look for “Reports” on the home screen. For any day you can look at the map of reports or a complete listing. The time, location, and some comments will be included. I should also note some interesting news. July 2012 is poised to set a record for the least amount of tornadoes recorded in that month, ever! The two tornadoes on Thursday made 16 confirmed, and the previous record was 42 in 1960. This number is staggeringly low, and while that has been a blessing in many respects, the lack of storms has made the drought situation across much of the country all the worse. Perhaps a look at the National Hurricane Center another day!